Fast-growing parts of Fort Wayne have special natural places, too, and ACRES Land Trust celebrates an addition to its Emanuel M. Popp Nature Preserve that adds a fifth chapter to a story being built by families who care for land and are working with ACRES to protect it forever. Preserving this cluster of properties provides a striking example of what can be accomplished over time by a small group of people who care for land. Since Jeannette (Popp) Kent family’s original 39-acre parcel (1) in 1996, ACRES Land Trust’s once-remote Emanuel M. Popp Nature Preserve has expanded piece by piece, nearly doubling in size to a 76-acre urban forest thanks to donations by neighbors John and Marcella Ellenwood (2 & 5), Dr. Albert & Jeanne Emilian (3). The Kent Family Foundation and the President Benjamin Harrison Conservation Trust Fund provided support to purchase a 21-acre parcel (4). The parcel joins what was originally a 39-acre nature preserve in Perry Township and is now 76 acres of protected land. It’s the tale of how patient steps can lead to conserving significant blocks of natural land. 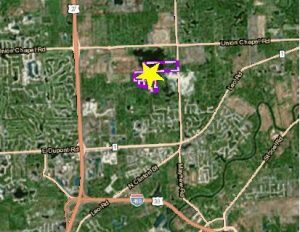 Even though development is closing in quickly on the area, earlier this year John Ellenwood decided to donate his home and associated three acres to ACRES as an investment property (#5 on the map, left). He gave ACRES the option to sell the land, convert it to a nature preserve, or otherwise use it as ACRES sees fit. This gifted acreage is the fifth addition to the ACRES properties there. Ellenwood and his wife Marcella, who passed way in 2015, also donated a four-acre woodlot in 2008 (#2 on the map). They first joined ACRES in 1965 and have been faithful members and donors ever since, said Jason Kissel, executive director. Jeannette (Popp) Kent, the first land donor, recalls weekend and week-long retreats to the deep undeveloped countryside, traveling to her family’s small cabin for hikes through the towering forest. 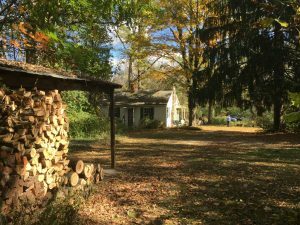 Though residential, commercial and institutional development is within walking distance today of the Popp Nature Preserve, its donors and their families remember enjoying the forested acres as children when the area was far out of town. Jeannette (Popp) Kent, the first donor, recalls weekend and week-long retreats to the deep undeveloped countryside, traveling to her family’s small cabin for hikes through the towering forest, sharing campfire meals, fishing in the pond, painting, reading and catching fireflies. Kent, who decided in 1996 with her family to sell the original 39 acres (#1 on the map) to ACRES at a bargain price, wanted the property to continue providing the same respite for nature and people that they had enjoyed for decades, Kissel said. 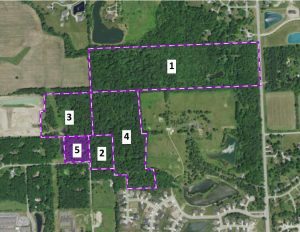 When the Ellenwoods made the second addition to the project in 2008, their hope was that their four-acre woodlot would become part of a larger forest someday, and it did in 2015 when a 12-acre donation by Dr. Albert and Jeanne Emilian linked the two earlier properties (#3 on the map). In 2017, Jeannette Kent and her family decided to protect 21 acres of neighboring land that was for sale (#4 on the map), with the help of the President Benjamin Harrison Conservation Trust Fund. 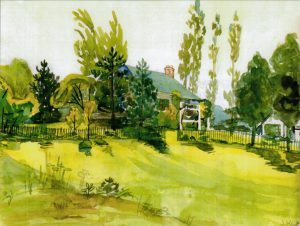 Watercolor of Popp cottage by Jeannette (Popp) Kent. The protected land is surrounded by fast-growing development – and still holds potential to expand. 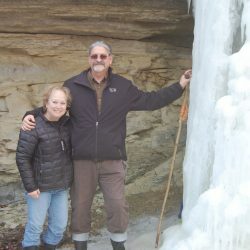 The Open House will be presented by Larry Biggerstaff, Popp caretaker, and include caretaker cottage tours, a campfire, hotdogs, refreshments and hiking in the old-growth forest.